Study Sports with Neuroscience! 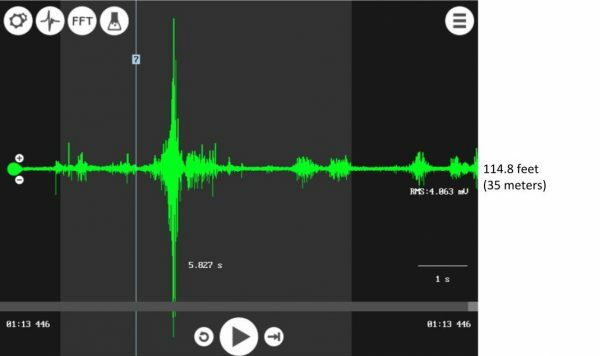 Check out this student-created experiment. Two loves combined in this student-created electrophysiology lab! Sports Science is a fascinating field that is a great way to get athletics students interested in science! 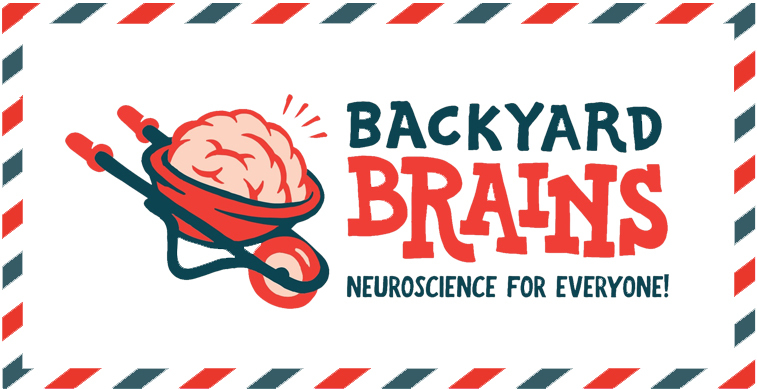 The students in Colegio Alberto Blest Gana in Santiago have been working with Backyard Brains tools over the past several weeks to come up with independent research projects, two of which are destined to become labs on the Backyard Brains website! One of these labs investigates the relationship between our leg muscles and the distance we can kick a soccer ball. Intuition agrees: the more muscles that fire the further the ball will fly, but what will the numbers reveal about the direct relationship between muscle activity, recruitment, and ball travel distance? Read on to find out! 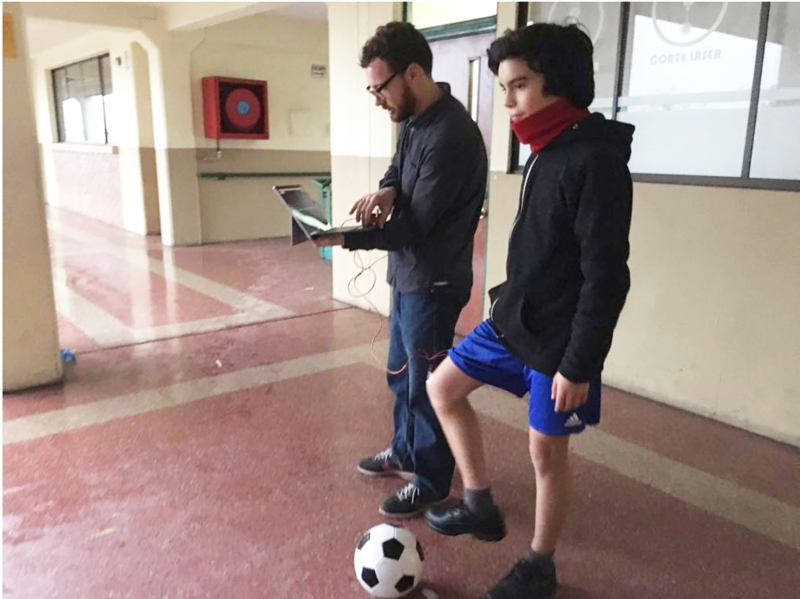 This group of students was interested in how electromyography changes when making different strength kicks in soccer: kicks made for small distances, like close passes, and kicks made for big distances, like aiming for the goal or to a player that’s far away. 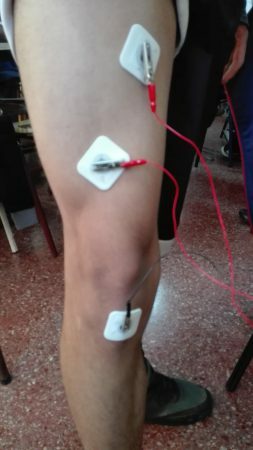 The group placed two signal electrodes in the abductor muscle of the quadriceps, and the ground electrode on the knee. 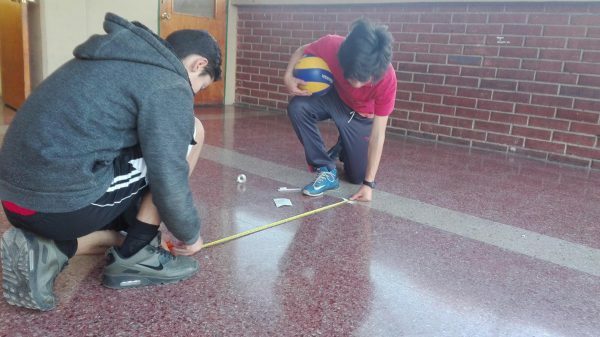 The students then placed masking tape in the floor, marking the distance in meters, and the subject kicked the soccer ball to a friend waiting at the various meter marks. The students kicked the ball to a number of different distances: 5 meters (16.4 feet), 10 meters (32.8 feet), 15 meters (49.2 feet), 20 meters (65.5 feet), 25 meters (82 feet), 30 meters (98.5 feet), and 35 meters (114.8 feet). They recorded EMG signals as they kicked the ball to the different distances. Here is a sample of the students' results. Of note - the "grey highlight" is selecting the window of the whole kick, including windup, kick, and returning the leg to rest. RMS (Root Mean Square) is a way to quantify the strength of the signal over the selection. This is measured in millivolts. As intuition does indeed suggest, the amplitude of the EMG of the quadriceps increases as the soccer ball kicks become more forceful. This was our hypothesis, that as you recruit more and more muscle fibers during a movement, the EMG signal amplitude will increase due to the higher number of action potentials generated and resulting increased magnitude of electrical activity in that muscle. 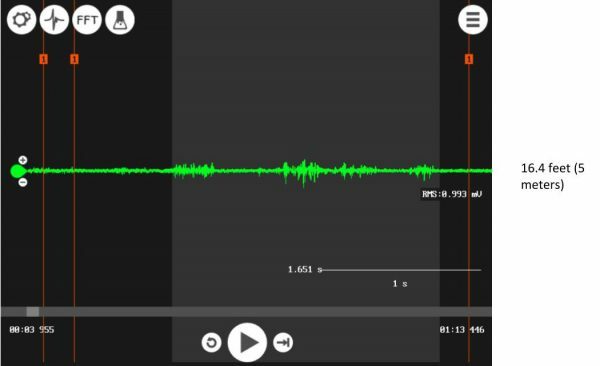 If we compare the medium to longest distance kicks, we can see that the average signal strength at 20 meters was recorded, over about 5 seconds, at an RMS "magnitude" of 2.37 milli-volts, and at 35 meters was at 4.86 mV. This reveals that to kick the ball 75% further, your body needs to generate 82% more "power." Like all good science experiments, there is always room for improvement. 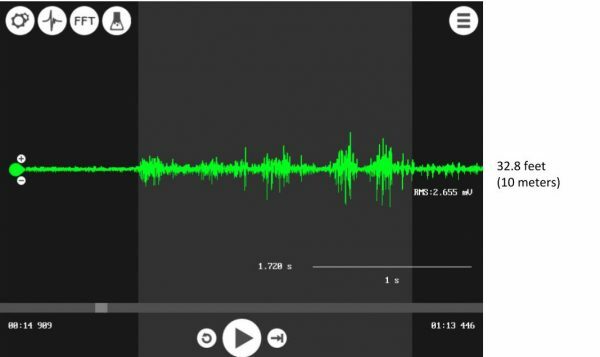 Can you think of ways that you or your students could improve this experiment? Could you remove potential confounding variables? Could you better standardize the procedure? How much more power is required to kick the ball different distances? Could you calculate the force generated in response to your kick using physics? Or create your own experiment: Would you use a different sport? Throw a football? Swing a baseball bat? Lift weights? Rock Climb? Here's my challenge to you: Do it, and share your results with us! 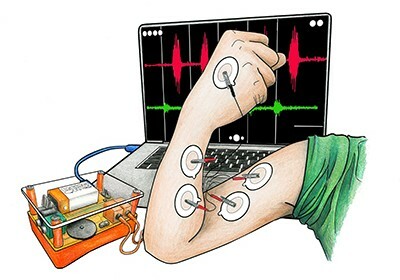 Do you have students who would be interested in learning about human electrophysiology? Do you have athletes who would be excited to learn about how scientists study athletic peformance and muscular endurance? Check out the Muscle SpikerBox Pro in our store! We used this kit to perform the experiment above, and so can you! What will EMG say about my 1RM on Bench? Copyright © 2018 Backyard Brains, All rights reserved.